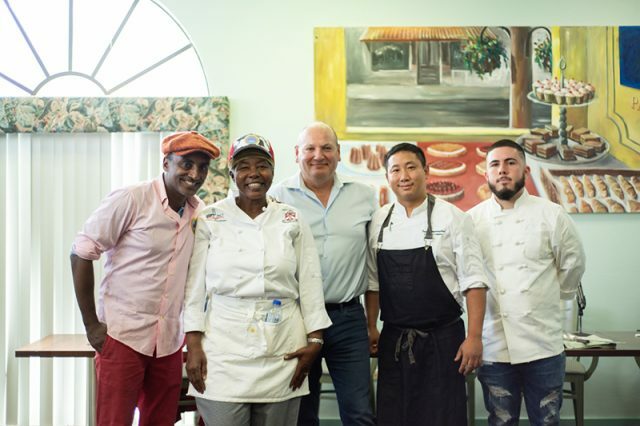 Celebrity Chef Marcus Samuelsson hosted an exciting competition for three top culinary students at Bermuda College this weekend, offering the winning chef, Renee Daniels, a contract to work at Hamilton Princess & Beach Club. The three Bermuda College culinary students, Mrs Daniels, Tremayne Bailey and Tamiyah Durrant, who took part in the event were nominated by their instructors. The competition involved three rounds: Canapés, Chef’s Choice and Mystery Box – wherein the chefs were presented with a box of unknown ingredients and given 30 minutes to create a delicious dish. The first round featured Beef Stuffed Arancini, Chickpea Coconut Stew and Beef Taco Nachos with the Mrs Daniels’ Arancini winning the public vote. The second round saw the judges presented with three delicious dishes from the chefs, representing some of their favourite foods: Coconut Curry Shrimp, Leek Mushroom Pasta and Tuscan Shrimp Pasta with White Sauce. In the final round, the Mystery Box presented to each chef included apple sauce, cheddar cheese Pringles, green grapes and a chicken breast. In addition to hosting the event, Marcus served as a judge, accompanied by Tim Morrison [General Manager at Hamilton Princess & Beach Club], Danai Hongwashkul [Chef de Cuisine at Marcus’], Shawn Ming [Chef Instructor at Bermuda College] and Anthony Sousa – last year’s winner and now a full-time chef with Marcus’. The panel of five judges rated the chefs’ on their professionalism, organisational skills in the kitchen and their dishes on innovation and tastiness. All are considered crucial components for a successful professional chef. Marcus Samuelsson said: “I am thrilled to have been able to take part in the second annual Chefs Competition at Bermuda College. The students here have great potential and I was so impressed with the dishes they presented. Teneika Eve, Senior Culinary Lecturer at Bermuda College, and co-host of the event, said: “We’re so excited to have created this tradition with Hamilton Princess & Beach Club, which is one of the biggest employers of our students after they graduate.